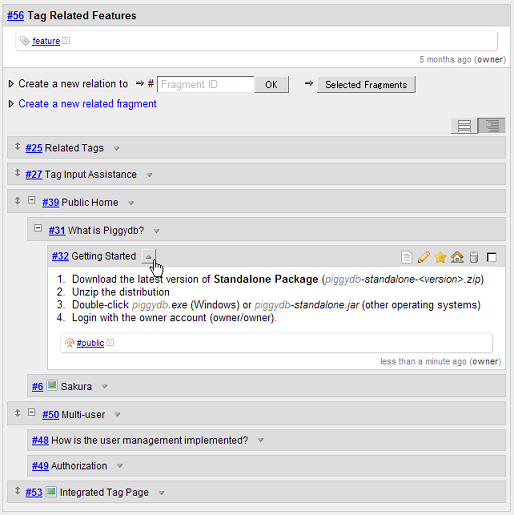 This release updates the fragment-tree view to have toggle buttons for each node to show or hide its content. The home toggle button was added next to the home icon, which allows you to show or hide the home fragments. The Standalone Package was updated to be multi-platform compatible. The package can run on any OS as long as Java and the system tray are available. This release adds a new package, Standalone Package for Windows, which allows you to use Piggydb as if it is a standalone desktop application. Double-clicking piggydb.exe in the package starts the server with a splash screen, as below. The Piggydb icon is displayed in the task tray while the server is running, and you can control the server with the right-click menu of this icon.